If you've been charged with an Ann Arbor Minor in Possession for the very first time, this doesn't make you a criminal or a bad person. I see clients on a daily basis who have have never been been in trouble, but find themselves being arrested or investigated for a crime. It's quite common that a young person will get themselves in a bad situation, which results in being charged with an Ann Arbor MIP. Being charged with this offense is not the end of the world; there are plenty of options to keep a clean criminal record. I handle MIP cases for students and non-students. Most commonly I represent University of Michigan students on Minor in Possession cases. 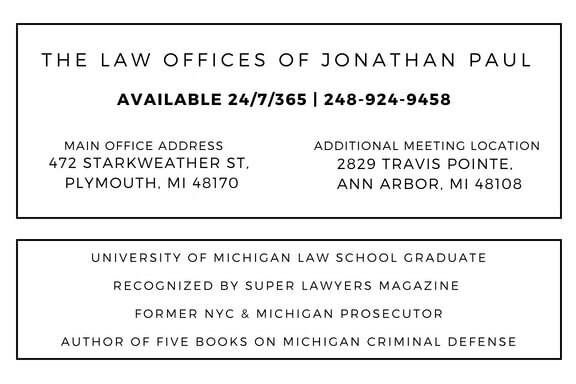 If you're a student at U of M, and are interested in my legal services, I would be happy to arrange to meet you on campus to discuss your case. I know you're busy as a student, and it's difficult and uncomfortable to go visit a law firm.